Discover a truly elevated hotel experience, just two miles from the terminals at BWI. 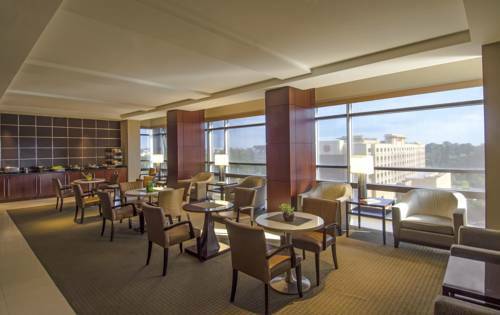 The Westin Baltimore Washington Airport offers a soothing atmosphere, helpful service and unmatched convenience. Our 24-hour, complimentary shuttle removes travel-related hassle, and our on-site parking facilities enable you to park and fly with ease. Casual yet sophisticated accommodations feature everything you need to enhance your well-being, from the Westin Heavenly Bed and Heavenly Shower to high-speed internet access and kitchenettes in select suites. Additional hotel amenities include a glass-enclosed indoor lap pool, the WestinWORKOUT Fitness Studio and delectable dining at Luminous Restaurant & Lounge. For those planning a meeting or event, we offer several adaptable venue spaces, including a scenic Function Lawn with a cozy fire pit. In addition to being near BWI Airport, our location in the Baltimore Washington Corridor makes it easy for you to explore the many landmarks and attractions in the area. Luminous Restaurant & Lounge: Sample fresh American and Pan-Asian fare at our welcoming restaurant, which offers playful flavor combinations and unique cocktails. It's the perfect place to start your morning in Baltimore, or to enjoy a meal and a drink before heading to BWI Airport.